Fantastic indoor-outdoor flow, with the large stacking rach slider doors opening out onto a spacious covered deck area, spilling onto a vast grass lawn. The house is warm and modern, heated via Heatpump, just walk in and be warm. 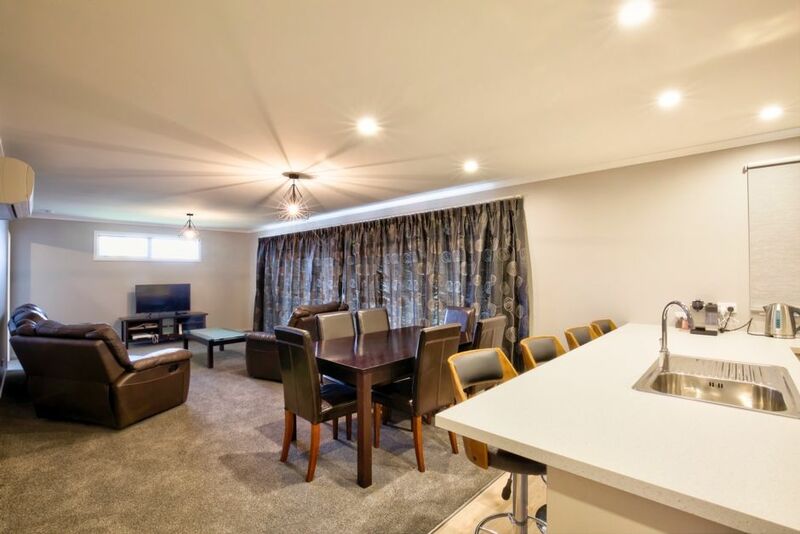 All kitchen appliances and dishware are onhand for your use aswell as pantry-staples being provided in order to cook your own meals should you choose not to take the short stroll to town to enjoy Te Anau's wide range of quality dining experiences. The entire house and garden is available for guest's private use. Located in a quiet street, with friendly neighbours, guests are able to enjoy their own space while feeling completely safe in this fabulous spot! 10 minute stroll to the Town centre, Restaurants and lake front. Parking available on-site with room on the lawn for boats etc to be parked. Complimentary unlimited Wifi. All linen provided. Laundry Facilities provided. We had a great stay at Lawson Burrows Retreat. House was clean and cosy, good for 2 families with kids. However it would be great if the BBQ Stove was well maintained. We were disappointed that we can't do BBQ during our 2 night stay. Host was very responsive to our request. Appreciate that. Overall would recommend for guest to stay over for their Milford Sound day tours. Location was not too bad, in a residential area. The house was a little awkard on a piece of land with no fencing, but was ok. The trampoline outside was the kids' favourite! The front door was where the laundry is. It was not too bad overall, well equipped and quite clean. The only thing that wasn't pleasant were the tea towels which had a nasty smell on them. Wifi was fantastic! All up, it was not too bad for a couple of nights stay and a few minutes drive into town. This was a great place to stay for a big group! The neighborhood is very nice...No views of the surrounding scenery but the back patio was nice to sit outside..Houses are close by but high fences still give you privacy. Lots of windows and very rooomy! Our only surprise was not having a dryer for clothes, but figured out that things dry quickly if hung outside. Checking in was easy after I contacted the owner and set up a time! We would stay again if coming back to the area. Had a great time on the e-bikes from Wild Ride!